Billy Paul played a hugely important role in the success of Philadelphia International Records. Not only was his 1972 album 360 Degrees of Billy Paul the first album released on the newly founded Philadelphia International Records, but his classic single Me and Mrs Jones gave the label their first number one single. However, Gamble and Huff’s association with Billy Paul goes back before they founded Philadelphia International Records. Indeed, the story starts back in 1967, when Gamble and Huff had their first hit as songwriters and producers with the Soul Survivors’ Expressway To Your Heart. Kenneth Gamble saw Billy Paul performing at the Cadillac Club. He was working on an album, Feelin’ Good At the Cadillac Club, but it needed some work to complete it. In stepped Kenneth, signing Billy to Gamble and Huff’s Gamble Records. Feelin’ Good At the Cadillac Club was soon finished and released. This was a jazz album, driven by the piano and inspired by female singers like Nina Simone and Nancy Wilson. For his next album, Ebony Woman, Billy fused jazz, soul and R&B. Ebony Woman would be produced by Gamble and Huff and released in July 1970, saw Billy interpret nine cover versions, giving them his own unique twist. On Ebony Woman, which will be rereleased by BBR Records on 28th May 2012, you can hear Billy developing as a singer, with 360 Degrees of Bill the cumulation of Billy’s development as a singer. After I’ve told you about the background to Ebony Woman, I’ll tell you about the music on the album. Psychedelic Sally was a track from Horace’s 1968 album Serenade To A Soul Sister. A chance meeting with Horace Silver saw Billy say how much he’d liked the track and immediately, Horace gave him the lyrics. While Horace’s version is a an instrumental, Billy’s interpretation is quick, full of emotion and energy and is a fitting and homage to Horace’s original track. With Psychedelic Sally and the other tracks that would become Ebony Woman chosen, recording would take place at a studio that would become synonymous with Gamble and Huff and the Philly Sound, Sigma Sound Studios. Recording of the nine tracks took place at Philadelphia’s Sigma Sound Studios. Gamble and Huff produced Ebony Woman, while Bobby Martin arranged two tracks and Stanley Johnson the other seven songs. Together with some of Philly’s hottest musicians, the album was soon recorded. All that was left now was for Ebony Woman, Billy Paul’s second album to be released. Only one single was released from Ebony Woman, the Bobby Martin penned Let’s Fall In Love All Over Again. It failed to chart, but proved particularly popular in Detroit, home of Motown. On the release of Ebony Woman on Neptune Records in July 1970, it reached number 183 in the US Billboard 200 and number twelve in the US R&B Charts. However, Ebony Woman could’ve been a bigger success, if the fickle finger of fate hadn’t intervened. Chess who distributed Neptune Records’ releases, folded after founder Leonard Chess died. After the success of Me and Mrs Jones and 360 Degrees of Billy Paul, Philadelphia International rereleased Ebony Woman in April 1973. By the time Ebony Woman was rereleased in 1973, Billy Paul had become Philadelphia International Records’ biggest artists. This time, Ebony Woman reached number 186 in the US Billboard 200 and number forty-three in the US R&B Charts. The rerelease of Ebony Woman which I’ll now tell you about, is an opportunity to discover another side of Billy Paul, when he was developing as an artists and performer. Opening Ebony Woman is the title-track Ebony Woman, written by Morris Bailey Jr. Two years later, in 1972, Harold Melvin and The Blue Notes would also record Ebony Woman, with the track appearing on their debut album for Philadelphia International I Miss You. With dramatic cascading strings, vibes and the rhythm section combining, the tempo drops way down, signaling the entrance of Billy’s vocal. Using Miles Davis’ maxim about the importance of space in music, the arrangement almost pauses, before Billy’s vocal enters. Like the arrangement, it veers between gentle and understated, to dramatic and powerful. Jazzy guitars, layers of strings and a standup bass punctuate the arrangement, before the rhythm section add to the drama of Billy’s now, powerful, jazz-tinged vocal. Bobby Martin’s arrangement not only compliments Billy’s vocal, but gets across and magnifies the drama and beauty in this powerful, moving and beautiful track. While many people have covered Paul Simon’s Mrs. Robinson, Billy with Gamble and Huff add something new to the track. It’s just the piano and percussion that accompany Billy as he scats the introduction, before delivering the lyrics quickly and with passion. The band that accompany him give the track a jazzy sound. Although a marauding bass, drums, flourishes of guitar and piano are key to the track, it’s Billy’s vocal that cascading, energetic vocal that breathes new meaning to the track. Anyone covering a song like The Windmills Of Your Mind will always be compared both Dusty Springfield’s peerless version and Anthony Newley’s populist version. However, Billy’s version is quite unlike both versions, and indeed unlike any version I’ve heard. It’s spacious, full of drama, just an acoustic guitar, subtle percussion and piano that accompany Billy’s thoughtful, considered vocal. Such is the effect of the track, that you’re enthralled, totally spellbound by the power of the track. As someone who loves Sly and The Family Stone’s original version of Everyday People, I was fascinated to hear how Billy and Gamble and Huff would approach the track. Nothing prepares you for this jazz drenched interpretation of the track. Billy delivers his vocal at breakneck speed, while his band produce an arrangement that’s quick, full of energy and brings new meaning to this anthemic track. Standup bass, hissing hi-hats, drums and piano open the track, playing with the same energy, enthusiasm and emotion as Billy delivers his vocal with. Cymbals crash, the piano crashes in and out, while the bass marauds up and down the arrangement. By the end of the track, you can’t believe this remarkable transformation of this Sly Stone classic. Together, Billy Paul with Gamble and Huff create a masterful interpretation, that’s uniqueness required vision and imagination. Let’s Fall In Love All Over Again was the only single released from Ebony Woman. Written and arranged by Bobby Martin, this to me is the best track on the album. It’s a track that points towards the future direction of Billy Paul’s career. It’s a beautiful ballad, with lush strings, a subtle rhythm section and flourishes of percussion and piano that are key to the arrangement and song’s success. Billy’s vocal is heartfelt, laden with emotion and passion. Quite simply, his vocal like the song is the best on Ebony Woman. Windy is a song that was previously recorded by The Association in 1967. Of the two versions, I much prefer Billy’s version. It’s bolder, has much more of an impact. Partly, this is down to the driving rhythm section that provide the track’s heartbeat. They combine with bursts of keyboards and Billy’s impassioned, powerful vocal. Here, the tempo is quicker, with the arrangement that fuses R&B and rock, is bolder than The Association’s. One other thing The Association didn’t have, was a vocalist as good as Billy Paul. Once you’ve heard both versions side-by-side, you’ll realize there’s only one winner…Billy Paul. Horace Silver wrote Psychedelic Sally, which was a track from his 1968 album Serenade To A Soul Sister. Here, the arrangement fuses R&B and jazz, while Billy’s vocal is delivered at breakneck speed. His vocal is full of energy, enthusiasm and emotion, while the piano and rhythm section combine. The rhythm section add R&B, while the piano sprinkles jazz throughout the arrangement and Horace’s lyrics are sixties psychedelia. This results in a compelling and fascinating fusion of musical genres and influences, that’s enthralling and quite irresistible. On Traces, the tempo is dropped, with Billy delivering a vocal that’s drenched in emotion and heartache. He’s accompanied by just piano, percussion and a rhythm section that play with subtly, providing an arrangement that’s variously spacious and dramatic. The band play around Billy’s vocal, providing an arrangement that reflects the emotion and drama in his vocal, but never once, overpower his vocal. Towards the end of the track, a piano and keyboards combine, providing layers of music that reverberate, reflecting the heartache, hurt and regret in Billy’s impassioned vocal. Closing Ebony Woman is a jazz-tinged version of Creedence Clearwater Revival’s Proud Mary. Here, Billy deconstructs and then reconstructs the song, breaking it down into something CCRs version never was. With just the piano and drums accompanying him, providing a backdrop that allows you to focus on Billy’s vocal and the lyrics. In doing this, you’re able to listen to John Fogerty’s lyrics, as Billy brings new meaning and energy to them. With his band, Billy adds drama, emotion and definition to the song, transforming it, making it very different and very special. It’s a quite different side of Billy Paul you hear on Ebony Woman. Instead of the soulful sound his later albums had, Ebony Woman is a much more jazz influenced album. This isn’t surprising, given Billy Paul started as a jazz singer. Eight of the tracks on Ebony Woman had previously, been covered by other artists in the three years before the release of Ebony Woman. These songs are an intriguing collection of songs, ranging from Paul Simon’s Mrs. Robinson, Sly Stone’s Everyday People and John Fogerty’s Proud Mary. That’s not forgetting The Windmills Of Your Mind covered by Dusty Springfield and Anthony Newland, plus Windy, which gave The Association a hit single in 1967. Each of the eight cover versions on the album see Billy inject new meaning and life to the tracks, often with a jazzy delivery and arrangement. However, the best track on Ebony Woman came from someone who Billy Paul and Gamble and Huff knew, Bobby Martin. He wrote and arranged Let’s Fall In Love All Over Again, the only single released from Ebony Woman. Later, Bobby Martin would play an important role in the success of Philadelphia International Records arranging, producing and writing for various artists. Let’s Fall In Love All Over Again is a beautiful ballad, with a sound that points towards his future soulful sound and style. Why Let’s Fall In Love All Over Again wasn’t a hit for Billy seems strange, given its quality and beauty. Two years later in 1972, Billy Paul would release both the album and single that made him Philadelphia International’s first male superstar. That was 360 Degrees of Billy Paul and Me and Mrs. Jones. However, although Ebony Woman is quite different in sound and style from albums like 360 Degrees of Billy Paul. 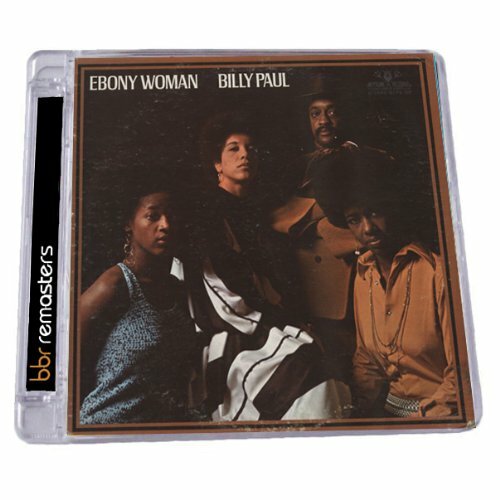 Ebony Woman is an album full of some wonderful and beautiful music For anyone who loves either Billy Paul’s music or the Philly Sound then BBR Records rerelease of Ebony Woman on 28th June 2012 is the perfect opportunity to discover another side to Billy Paul and his music. Standout Tracks: Ebony Woman, The Windmills Of Your Mind, Let’s Fall In Love All Over Again and Psychedelic Sally. ← BIG BOY BLOATER AND THE LIMITS-BIG BOY BLOATER AND THE LIMITS.